For more than 20 years, The Brainy Baby Company and Brainy Baby® products have entertained and educated toddlers and preschoolers with quality, award-winning and University Tested DVDs, CDs, Toys, Books and more. DANO2's Toys are made 100% in the USA out of FDA compliant, medical grade materials. Like all parents, we want our kids as safe, happy and comfortable as possible, especially when traveling long distances. Long distance travel on booster seats presents complaints with which every parent is familiar. The Keester®, a cushion engineered for the comfort of your child, brings resolution to these uncomfortable situations. We are delighted to bring you a unique baby collection of infant booties for those who appreciate fine quality, great design, and originality. A unique approach to infant and toddler development, exercise and entertainment, First Toddle® emphasizes Gross Motor Skills AND improved Cognitive Development. The firstSEAT REVOLUTION is a state of the art child restraint system designed to better protect children in frontal or side impact collisions. Top quality, well and lovingly designed products and a high degree of safety - that's what FREDS SWIM ACADEMY puts the emphasis on when it comes to designing products for children who are learning how to swim. Genius Babies is a baby boutique that specializes in unique baby gifts, baby shower presents, and educational baby toys. gonto is the go everywhere, do anything bag just for you. The Hush Baby award winning CD was specifically designed to calm infants. Founded and led by seasoned technology, marketing, and sales individuals in the high tech industry, iaxisi is focused on developing innovative and high quality products. Icy Diamond Totes™ is a new company, established in April 2009 in Chino Hills, CA by a mom-inventor. Developed by Ingrid Carney from experiences of her pregnancy for her daughter Isabel, the BellaBand was introduced to help women enjoy getting dressed every day during pregnancy. Jaden's World's products are designed for baby’s comfort and parents' peace of mind. Jazzy Toes' goal is to provide unique and stylish products for both boys and girls, while expanding the range and selection for boys. Lil' Love Bug™ Hair and Bath Products are made specially for kids. We believe children have the most fun when they're discovering new things. That's why all Kid O Products are thoughtfully designed with lots of opportunities to explore built right in. CARES - child aviation restraint system is designed offer children a safer flight. Kinderville offers innovative, functional and toxin-free products for babies and toddlers. With a focus on quality and the use of safe materials, all Kinderville products are thoroughly safety-tested and are BPA-, Phthalate- and Lead-free. What began as a single, handmade diaper for a baby named Kissa has blossomed into a worldwide sensation enjoyed by babies, moms and dads alike. Not just another rattle, but a uniquely designed and developmentally functional American made premium first toy, not just for preemies, but for all babies. Manhattan Toy maintains a more than 20-year tradition of distinctive design that instills ingenuity and originality into every toy. Miracle Industries is the creator of The Miracle Blanket, the closest thing to an "off" switch for your crying baby. The most pediatrician-recommended swaddle in the world. A completely unique and original way to announce the birth of a new baby or celebrate a special occasion with a personalized gift. All YBike products have been engineered with safety in mind and designed to help develop balance, co-ordination and self confidence in young kids. NO SLIPPY HAIR CLIPPY INC.
No Slip Hair Accessories® are a No Slippy Hair Clippy® specialty — They differentiate themselves from the competition by using unique designs and color combinations, as well as mirroring current trends in the fashion industry. Organic Caboose® specializes in affordable organic & eco-conscious products for baby and mom. We are a child-inspired and mommy-designed company founded to solve some of the everyday challenges that come with caring for infants and toddlers. At P'kolino we believe children learn and grow through play. Paci-Plushies™ are quickly becoming a hit for babies and toddlers of all ages. Pacipalz is the "Love-me, Hug-me, Snuggle-me Pacifier your Baby will love"
Patch Products is a family-owned company, leading the toy industry in design, manufacturing and marketing of games, children’s puzzles, preschool toys, creative activities and teaching tools. PlayAbility Toys designs and makes toys for children with special needs, toys and learning tools that are fun, stimulating and make a difference in every childs' development. We are a company that has developed a disposable potty which helps parents handle their child's potty needs on the go, it's called the Pottyflip. At Price Products our mission is to provide parents with innovative products that serve a practical purpose. Rashti & Rashti is a newborn company dedicated to creating baby products that delight and please moms and gift-givers alike. Founded in 2007 by Shaindy Alexander, RiNGLEY is the original Canadian natural teether that combines two efficient teething tools: untreated Maple wood and 100% organic cotton terrycloth. Rump•a•rooz® One Size Reusable Diapers are a revolutionary change to the face of cloth diapering today! Salus design and produces marine wear for adults and children. Shanda Toys creates innovative & kid-friendly products for bath & play that are multifunctional, fun and appealing to both parents and children alike. Winner of over 30 national awards, So Smart! Productions is a leading creator of educational entertainment products for young children. Founded in 2006 by Judy Kang, a highly regarded occupational therapist specialized in infant and toddler development since 2001, Spotlight Baby's mission is to provide parents with developmental tools and eco-friendly products to support babies in reaching their full potentials. Sprout Shell is a privately owned and operated company run by moms, for moms. Star Kids Products is proud to introduce Snack & Play Travel Tray (Patent Pending), a unique and innovative product for families on the go. TagBall™ and TagRattle™ – Simple. 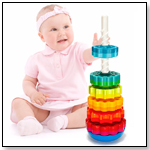 Fun.™ toys for infants, babies and toddlers. We are a wholesale gift & furniture company based in Edgewood, New York. Created by teacher turned mom, Heather Sievers, Time Out Spots are the solution to unsuccessful time outs. The experts in soft developmental toys. Award winning toys from a company you can trust. TootnTinkle offers worlds best Toilet Training products — proven to help children of all ages Toot & Tinkle become your child's new best friend when toilet training. Trend Lab, LLC is a privately held Minnesota based company formed in 2001 with the fundamental belief that new parents desired sophisticated, trend-right nursery décor to flow with their home décor. Tricycle Press publishes books for kids and their grown-ups, from quirky board books to award-winning picturebooks. The New Concept in Bathing Babies! Two Little Hands Productions, LLC. Signing Time is a sign language video series for hearing infants and children that teaches them basic American Sign Language (ASL) in a fun and memorable way. Created by a grandmother, the philosophy behind Zatswho™ is to fully embrace the core concept of love of one's family.